Plant endoglucanases belong to Glycoside Hydrolase Family 9 (GH9), which contains enzymes capable of hydrolysing β-1,4 glycosidic bonds within a glycan chain. The GH9 family in plants has been divided into three sub-families on the basis of variations in protein sequences [1, 2]. The GH9C sub-family proteins are comprised of a single N-terminal transmembrane helix, a GH9 catalytic domain, and a C-terminal carbohydrate binding module (CBM49). Urbanowicz et al. showed that the CBM49 module of SlCel9C1 from Solanum lycopersicum binds crystalline cellulose . Figure 1. A secondary structure representation of the predicted model of SlCel9C1 CBM is shown in cyan, the proposed functionally important residues are shown in stick. The CBM2 NMR template used for model prediction (PDB ID 1EXG) is shown in red. This figure was adapted from . CBM49 domains are about 100–110 amino acids long . BLAST searches and predictive protein modeling indicate that these domains are most similar to CBM2 . A refined model of the SlCel9C1 CBM domain (Figure 1), based on the type A-binding CBM2 NMR template from Cellulomonas fimi xylanase 10A (PDB ID 1EXG), closely matched the features of the β-barrel fold of the parent structure (i.e. only a few short insertions/deletions are present in the final alignment) . The model indicates surface localization of three key tryptophan residues, Trp522, Trp559, and Trp573 on the predicted β-barrel fold . Furthermore, site-directed mutagenesis of SlCel9C1-CBM49 showed that Trp522, Trp559, and Trp573 contribute to the interaction of the CBM49 module with crystalline cellulose (BMCC) . These results suggest that the CBM49 interacts through a type A mechanism. CBM49 modules are found appended to plant GH9 endoglucanases, and are described as unique to plants  though CAZy has also classified proteins from Amoebozoa into the CBM49 family. The three members of plant GH9 class C have not been well studied in Arabidopsis, however, the tomato and rice orthologs of At1g64390 (AtGH9C2) have been examined. For example, Urbanowicz et al. provided evidence for the binding of the tomato SlCel9C1 CBM to crystalline cellulose, as well as hydrolysis of artificial cellulosic polymers and a variety of plant cell wall polysaccharides by the catalytic domain . A similar study was performed on the orthologous rice endoglucanase by Yoshida and Komae , further confirming that the catalytic domain is capable of hydrolyzing a suite of polysaccharides . There is also evidence that the rice CBM49 (previously called a CBM2) is post-translationally cleaved from a 67 kDa form to 51 kDa endoglucanase isoforms . The authors suggest this may play a role in establishment of lateral root primordia from differentiated pericycle cells as the CBM likely facilitates the hydrolysis of crystalline cellulose . Thus, the uncleaved enzyme could participate in the removal of secondary walls from the pericycle cells which contain crystalline and insoluble polymers . The authors also suggest another alternative, that the full-length enzyme may be inactive until it reaches its target in the cell wall, where it is then cleaved by proteolysis so that the catalytic domain is 'activated' in proximity to the substrate . Glass et al. have shown that over-expression of poplar PtGH9C2 in Arabidopsis, together with down-regulation of Arabidopsis AtGH9C2 using RNAi, results in plants with modified degrees of cell wall crystallinity, which was inversely correlated with changes in plant height and rosette diameter . Thus, over-expression of PtGH9C2 resulted in a decrease in height and rosette diameter and an increase in cell wall crystallinity . Whereas downregulating AtGH9C2 increased height and rosette diameter and decreased cell wall crystallinity . The authors suggest that genetic modification of PtGH9C2 and AtGH9C2 expression levels in planta indicate that their CBM49s function to target the GH9 enzymes to crystalline cellulose prior to proteolytic cleavage, thereby regulating cross-linking with hemicellulosic polysaccharides, preserving the crystallinity of the newly synthesized cellulose microfibrils and limiting cell expansion [7, 8, 9, 10]. 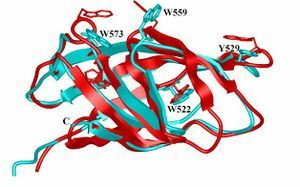 The cellulose binding function of CBM49 was first demonstrated in Solanum lycopersicum SlCel9C in 2007 . There is no available structure for CBM49 at this time, though a model has been predicted based on the structure of a CBM2 . This page was last edited on 23 November 2018, at 02:19.